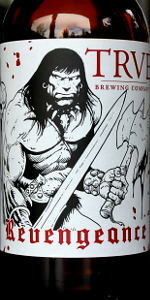 Home Beers TRVE Brewing Co.
Revengeance | TRVE Brewing Co.
Nice hybrid of wild ale and porter. Slightly tart and funky up front, roasty finish and somewhat creamy mouthfeel. For those that like the dark sours, definitely recommended. I had this beer on-tap in a goblet at Collins Pub in Seattle. Appearance: black with a thin layer of tan foam. Nice. Smell: tart, fruity, caramelly and roasty. Kind of reminds me of a Flanders red with a little dose of dark malt -- good stuff! Taste: like the aroma, but better. Sweet, caramelly, fruity, a little tart and just a dash of roast. It really works for me. Mouthfeel: medium body with a decent carbonation and a decent, rocky creaminess. Overall: I love Flanders reds, and that's basically what this is. Drinkable and very interesting; definitely worth trying. Bottle. Wacky beer. Looks good. Smells like it has a bit of aromatic autism. Porter with wackiness. The flavor was super cool. Starts off tangy and bretty but it finishes purely porter-esque. Good feel. Someone told me this is what old porters tasted like. I liked it! After going through the bottle, from slightly chilled to room temperature, I came to the conclusion that I am incapable of deciding what ratings to give this beer. But, no matter the numbers, here's what I got out of Revengeance. A dusty, blood-smattered bottle at least a few months old, perhaps over a year, without a date other than the estimations of the friendly yet tenebrous bartender murmured overtop the hums of metal and small, lax crowd. Before the cap was even halfway pried open, a light brown, sour foam gushed out, oozing down the label. In a bulbous wine glass it settled to a black body with a dark brown edge and head that seemed to want to escape the physical realm as quickly as possible, only a few near-microscopic bubbles streaming to the surface. I would say the aroma is about the same as my bartender, friendly, warm, inviting, sour from something or someone in their past, and very unique. Dark cherries, currants, tart strawberries, sour Warhead candies, cherry almond cola, faint Amaretto, raisin, chocolate and caramel green apples, plums and sweet cantaloupe. Sniffing so close and so fierce as to almost inhale the beer summons subtle barbecue sauce and chocolaty and fruity, blueberry-like roasted coffee bean aromas. Cherries, crab apples, Extreme Warheads, yogurt-y and Orange Gatorade tang, plums, dried mango and sweet lemon and lime, a bit of bite similar to that of bleu and feta and sharp cheddar cheeses towards the end, and a lingering, soft sour, tart, fruity, subtle grainy finish. Some Shiraz notes of red grape skins, spice, warmth in the chest, brûléed strawberries, fresh mountain dirt, pine needles and bark, and cracked granite. Breaths of cool, minty, chamomile tea and cola. Absolutely unique, wonderfully complex. The mouthfeel is like a briefly oaked red wine save for the touch of prickly carbonation, and it leaves with not so much a pucker but a French Kiss and blushed cheeks. Had on tap at Armsby Abbey. Such an unique beer. Starts off tasting like a real good sour and as you finish your mouthful, the aftertaste fills your mouth with Hazelnut. Ordered a second glass immediately after I finished. Revengeance from TRVE Brewing Co.